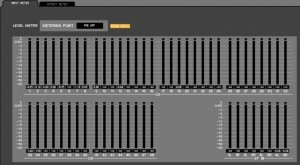 Alright, so yo have your computer happily talking away to your Yamaha digital board. You move a fader on screen and it moves in real life (that never gets old). Getting here was the subject of yesterday's post, which you can read here if you missed it. Hopefully, you're wireless so you can even to it from across the room. And that's all well and good, but what are some real-life applications of this very cool technology? Well, here are a few that I can think of. I really like this interface. We're looking at the Output Patch here, because that's where I do most of my patching. The mix busses are listed on the left, and it's easy to name them so you can keep them straight. The actual outputs are on the top. Want a mix bus to go to an output? Put an orange dot there. It's that simple. If that doesn't save time, I don't know what will. Perhaps the most common use for my laptop during a service is to act as a complete input meter. With the meter pane up, I can monitor all 48 channels in, plus stereo. Or I can quickly check my output levels (which is a bit redundant since we have the meter bridge--but if you don't, it's right here). I don't know if this ever happens to you or not, but every week, I do a sound check and get initial levels from each instrument. Then, during the service, everyone plays louder. Sometimes a lot louder. I've taken to setting my initial levels at -12 or less, knowing that when it all comes down, everyone will be up near 0. Because we're digital, once we run out of bits, we're done. So I try to avoid clipping at all costs. The meter section helps me keep an eye on who got way too loud so I can dial them back a tad. Turning on Peak Hold makes it even easier to spot. Sure I know the console has a full-screen monitor page, but this looks way cooler. Since I can, I like to get as much of my show built before I arrive at church. I'll plug in all my channel names, set some initial monitor levels, get my patching in line, that sort of thing. Studio Manager lets you do all this off-line, and gives you the ability to save your settings to a file that you load onto your USB key. Pop in the key, load the show, and you're 80% there. 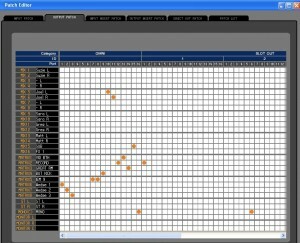 Using the individual Channel Overview, you can dial a lot of things in quickly. 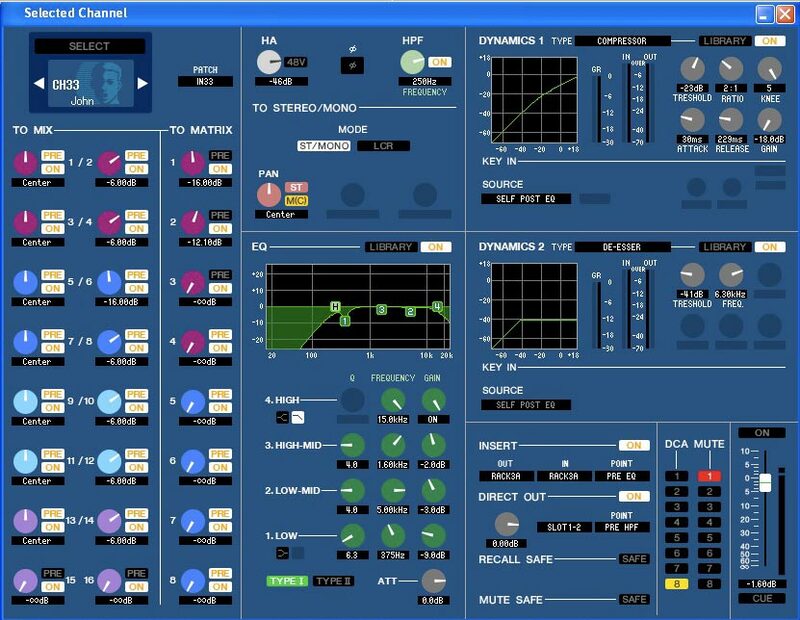 Using this window, you can dial in monitor mixes, matrix sends, load EQs from the library, adjust initial settings for dynamics 1&2, set up DCA and Mute assigns, turn phantom power on and off, even patch in stuff from the Rack. And using the arrows in the top left, you can quickly go through all your channels. I've found this to be a huge timesaver. Now, I'll make a distinction here. When I say in-venue, I'm referring to mixing by remote while being in the room the console is in. It's the functional equivalent of picking the board up and dragging it around the room with you while you listen from various points (if that were even possible). Unless you have a room and speaker system that is really, really good, it's likely that it sounds a little different depending on where you sit. If you have a room like ours, it can vary wildly depending on where you sit. Getting a good mix is all about finding a happy medium. We used to walk the room, listen, make mental notes, then head back to the desk and implement changes. This process was fraught with problems. Not the least of which being that you can't immediately hear the result of your changes in the area that you need to. Now, we just carry the laptop around and tweak from where we are. This has the added benefit of giving us the ability to respond to monitor requests from anywhere as well. It would never fail that we'd be all the way over on the other side of the balcony and someone would need a little more keys. Now, we just dial it up. Everyone's happy. Plus, it looks really cool. One day I was mixing for the contemporary service and one of the pastors saw me wandering around the main level with my laptop. He said, "What are you doing?" I answered, "Oh, just making a few mix tweaks here and there." He took a look at the screen and said, "OK, now you're just showing off." We both had a good laugh, but the reality is this goes a long way to helping convince people you know what you're doing. This is the mode I operate in every weekend when I'm TD'ing Upper Room. I normally sit in the tech booth, which is essentially sealed off from the main room. We have a matrix feed sending to the booth, which is what we use to record the services. I used to spend a lot of time calling down on the com, "Can you give me a little more lead vox in our mix," and "a little less electric guitar." It got to be a bit annoying, for both me and the FOH engineers. A few months ago, I figured out that I can dial in my own levels in such a way that doesn't impact the FOH engineer, and gives me a reasonable mix. It's not "mixing" in the truest sense of the word since it's a bit coarse, but it's close enough and gives us decent results. The key is in setting up the workspace correctly. By selecting to view only the first 4 mix busses (which I then toggle to the Matrix), I have enough height on my screen to almost get all 3 sets of 16 channels visible with minimal overlap. Now to really appreciate this, you need to enlarge the photo. Go ahead, we'll wait. Circled in yellow is where we mix. As I mentioned earlier, it's a bit coarse, but by dragging those little orange bars left or right, you can adjust the send for that channel. When I need a little more lead vocal, I go to that channel, and pull it up a little. It's not an exact science, but it works. 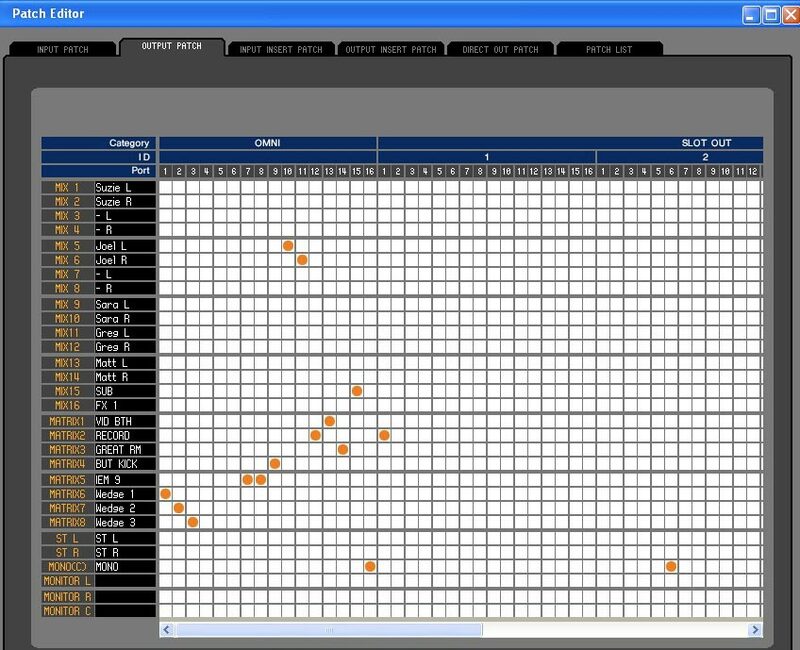 You can accomplish the same thing with more precision by hitting select, and going to Channel Overview, but that means you're also hitting select on the board, and that can mess up the FOH engineer. Now, from a setup standpoint, I highly recommend you go with mix busses for monitors and a matrix for a remote venue. The reason is simply this: If you have your mix busses in front of you, it's way too easy to think you're turning up your mix and accidentally turn up the lead guitar in the worship leader's mix. Yeah, I did that. Once. But no more. I don't even have the mix busses on my screen, so the worst I can do it turn it up too loud in the lobby. No real harm done there. 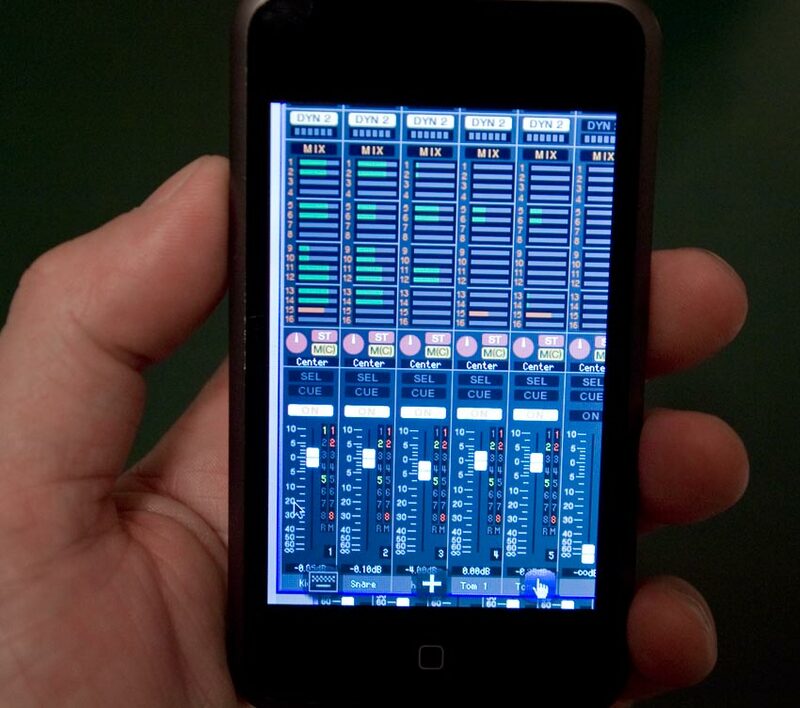 The beauty of this type of mixing is that you can be anywhere on your network. The tech booth up the stairs or in the gym on the other side of the building. Doesn't matter. As long as you're on the same subnet and can access the mixer, you can tweak the send to your heart's content. And you don't bug the main FOH guy. We have now crossed into a whole new realm. I'll give the disclaimer that it's not entirely practical, and because it's a bit slow, you really can't mix this way. But it's really cool. With the advent of version 2.0 of the iPhone (and iPod Touch) software and the App Store we can now ascend to the 7th level of geekiness. 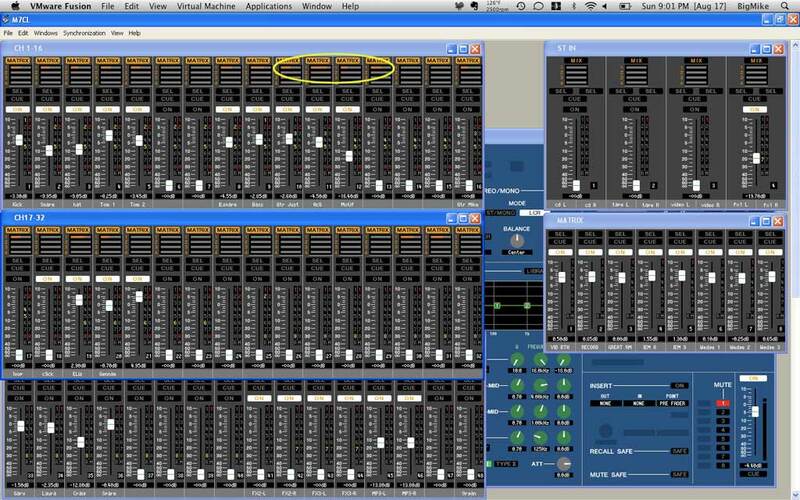 Using Mocha VNC, a Virtual Network Control application you can remote control your Mac. Technically, you could do it on a PC too, but I understand it's tricky to set up. Download the App onto your iPhone, then drop into System Prefs on your Mac and enable VNC control (that's a bit redundant, isn't it?). How to do that is beyond the scope of this article, but it's not hard. Poke around in the Sharing pane a bit, you'll find it. 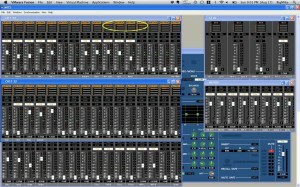 Next, launch Parallels, Fusion or Bootcamp and get Studio Manager running on your Mac. Now, connect to your Mac via Mocha VNC. Guess what? You can now control the M7 from your iPhone. Now, before you go rushing out to buy a new iPhone just so you can mix from it, let me warn you that due to the limitations of bandwidth, the screen refresh rate is pretty slow. That means that your visual feedback loop is so slow that you can't tell if you're actually moving a fader until the screen updates. 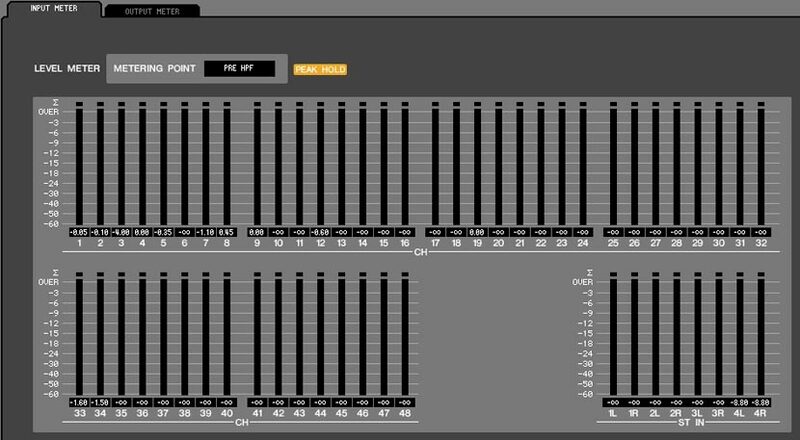 The fader moves in real-time, but you can't tell if you're actually on it or not. The most useful function of this is turning on and off DCAs at the moment. But it's only version 2.0--we'll get there. I keep wanting to do this in front of Brad, the aforementioned pastor who thought I was showing off when I was mixing from my laptop. Now I want to tell him, "Oh yeah, the laptop is just way to heavy to lug around. This is where it's at..." Now that's showing off!